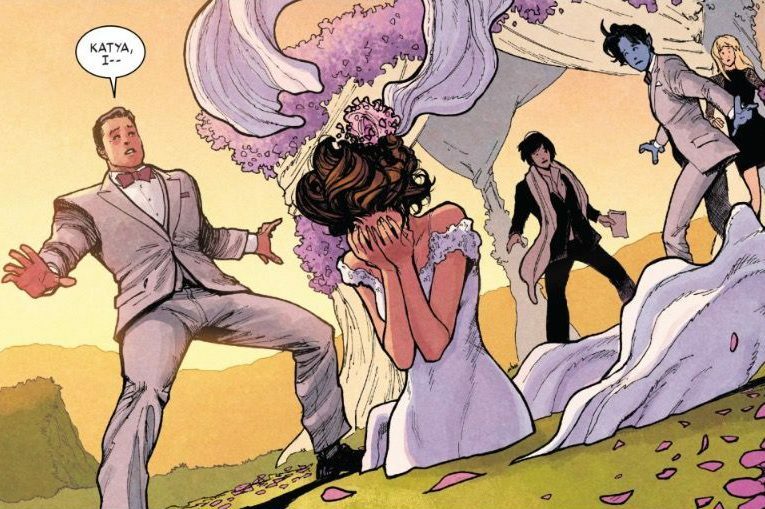 Marvel’s rather hilariously promoted “Wedding of the Century” found X-Men Kitty Pryde and Peter Rasputin getting engaged. 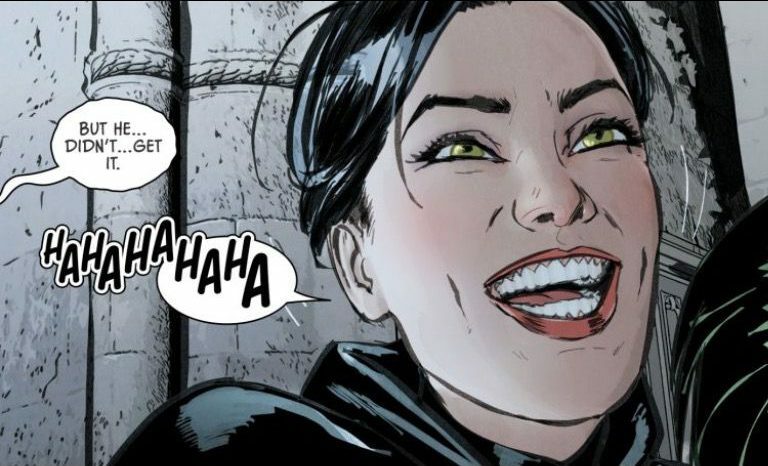 Over at DC, writer Tom King has spent the last year and a half bringing Batman and Catwoman together. Warning! Massive spoilers follow! We’re digging in here deep, people. In “X-Men Gold” No. 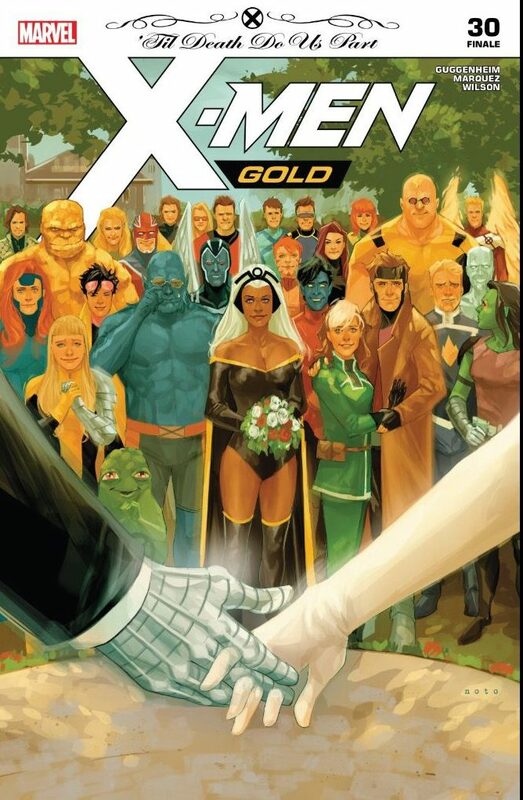 30, cover date August 2018, “‘Til Death Do We Part,” written by Marc Guggenheim and illustrated by David Marquez, Illyana Rasputin spends three pages dicking around before telling her best friend and future sister-in-law Kitty Pryde that she doesn’t think she should be marrying her brother Peter. “…I just think if you two were meant to be together … it would’ve happened by now,” she says. Of course, another way of looking at this would be that, after all these years, Kitty and Peter finally got it right. Anyway, this one conversation is enough to roil Kitty. At the altar, as Peter moves to slip a ring on Kitty’s finger, she turns intangible. Talk about disappearing into the earth. Then she phases right into the ground. And that’s how a merry mutant wedding ends. Later, Peter finds Kitty and asks, with the kindness and patience that must be mutant powers in of themselves, whether she loves him. It’s the vaguest of story, with the wimpiest conclusion. Meanwhile, in “Batman” No. 49, cover date August 2018, written by King and illustrated by Mikel Janin, the conclusion of “The Best Man” finds the Joker trying to kill Catwoman to prevent her wedding to his greatest foe – and his greatest reason for existing. 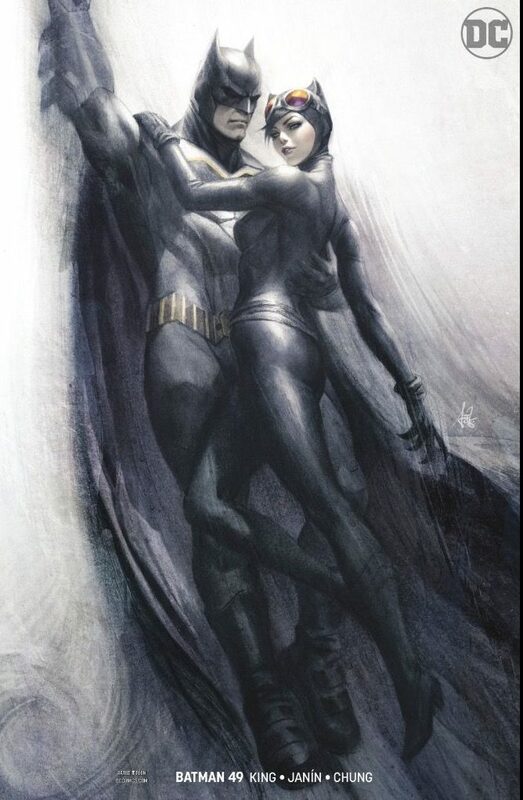 Batman – who never appears on panel – pops up and consoles Selina, sort of. And Catwoman laughs and laughs. Does this look like a woman about to walk down the aisle? In “Batman” No. 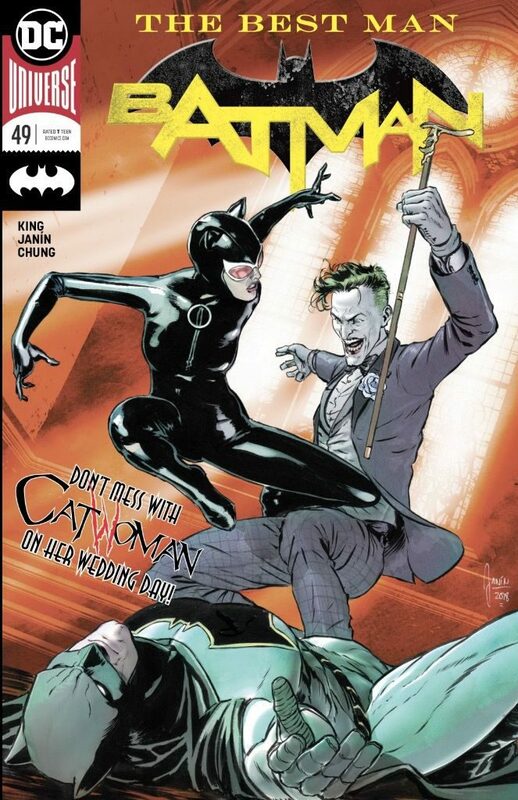 50, the Bat and the Cat are headed down the aisle, and I have no inside knowledge, but it sure seems as if Catwoman is going to do a runner – believing that she must do so for Batman’s own good. The similarities and the timing between the rival companies’ arcs seem beyond coincidental. And while this hardly falls under industrial sabotage, it sure does reek of dirty tricks. It wouldn’t be the first time. DC writer Arnold Drake believed Stan Lee had swiped the idea for the X-Men from his Doom Patrol. Then there was moment Marvel announced to the press that Captain America was a Nazi – stealing all the headlines from DC, which was relaunching all its titles. If you were a suspicious sort, you could imagine Marvel getting wind of this major story featuring the No. 1 character from its No. 1 rival and deciding to steal the wedding bouquet. It shows. The “X-Men Gold” story has seemed rushed from start to finish. “Batman” has been deliberately paced for more than a year, with characters behaving in ways that can at least be understood. Then again, it could all be crazy coincidence. Your knowledge of the industry is remarkable. There is but a fine line between passion and insanity, my friend.